If your rabbit's fur suddenly starts falling out, don't stress out before you've determined what's triggering it. Although some causes of fur loss are serious, it can also occur in healthy rabbits. Your rabbit might be shedding. Healthy rabbits generally shed their coat twice a year, provided they're exposed to consistent environmental conditions. If you constantly move your rabbit between a cool outdoor environment and your warm home, he might shed more often. Shedding is especially heavy after winter, when your rabbit no longer needs his thick coat. A fiber-rich diet, regular grooming and unlimited access to fresh water can prevent hairballs and intestinal irritations during this time. If you're suspicious about your rabbit's fur loss, don't hesitate to take him to a veterinarian. Sometimes a health condition, such as parasites, a hormonal imbalance, dental problems, or a bacterial or urinary tract infection can result in hair loss. 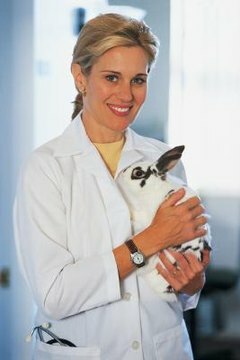 A veterinarian can examine your rabbit and run some blood tests to determine what's wrong. After making a diagnosis, he can recommend proper treatment. A pregnant rabbit prepares for the birth of her young by making a nest. She might do this with soft materials she finds around the house, such as the stuffing in pillows. She might also resort to pulling fur from her belly, chest or sides for nesting material. An unspayed rabbit who displays this behavior might be having a false pregnancy. Consider having her spayed to prevent future health problems that are linked to an intact female reproductive system. If your bunny is bored, don't be surprised if he resorts to excessive self-grooming and pulling out his own fur. If you have multiple bored bunnies in one cage, they might start grooming and pulling out one another's fur. Providing a variety of toys and allowing them time to run free can stop the undesired behavior. Fighting bunnies can also damage each other's fur, and stressors, such as inconsistent feedings, noise, pain and fear can also cause fur loss.